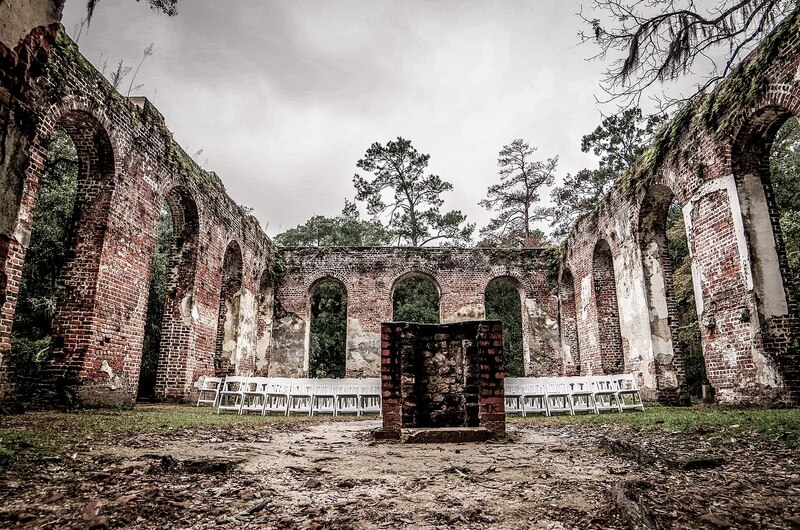 Whose Evangelicalism is in Ruins? The American Academy of Religion, the national scholarly association for religious studies in America, just sent out its program of plenary addresses for its upcoming annual meeting this November. The abstract for David Gushee’s Presidential Address caught my eye. There are a number of things to say about this. First of all, I told ya’ll this would happen during the nomination process three years ago. Looking closely at the abstract, the phrase “will perform ‘religion in public’ in a confessional vein” jumps out at me right away. The theme of the annual meeting, chosen by Gushee as president, is “religion in public” and this sentence shows the versatility of that phrase. The phrase “religion in public” usually connotes the area where scholars investigate how things called “religion” show up in the public sphere. Or sometimes, especially within the AAR and it’s mission to “enhance the public understanding of religion,” religion in public means that scholars share their knowledge about things called religion with the public. But this is neither of those. Gushee will be performing religion in public. He will be bringing the thing called religion into the public. But what public? A room full (or maybe not full) of scholars in a massive conference center who paid the exorbitant registration fees of the AAR? That’s not exactly Times Square or a CNN studio. But it’s the last half of the sentence that reveals what I think is really going on here: “in a confessional vein.” Gushee will address the AAR members, not as a scholar of religion, not as a humanist, not as a social scientist, not even as an ethicist, but as a confessional “evangelical” within so-called “evangelicalism.” Furthermore, this will be an address that seeks to redeem so-called “white American evangelicalism.” So what would one call a public performance of religion in a confessional vein by a white American evangelical about the redemption of a ruined white American evangelicalism? A presidential address? An act of scholarship? A public relations stunt? A sermon? Jesus Christ. If we’re going to have someone speak about the ruins of evangelicalism (a potentially worthwhile topic), can it at least be someone who doesn’t *still* identify as evangelical?! ^^^^^this. White evangelicalism is not dead, not in ruins. It most evidently holds the reins of power. “We are in mortal danger,” Linda said. “We are in a religious war,” Sheila said. Yet, the President of the United States, a white man, is the candidate chosen by 80% of self-identified white evangelicals and the President of the American Academy of Religion, also a white man, is a self-identified evangelical. What exactly is in ruins? Whose evangelicalism is in ruins? Because it seems like within the political culture of the United States white American evangelicalism of the kind that supports the President is ascendant. And within the American Academy of Religion, the kind of white American evangelicalism that Gushee has promoted and the kind represented by so-called progressive evangelicals like Jim Wallis (also a plenary speaker at the AAR this year) is getting center stage. For the scholar of religion, Gushee’s abstract and the WaPo story are two interesting pieces of data. Comparing the two evangelicalisms reveals stark political differences. 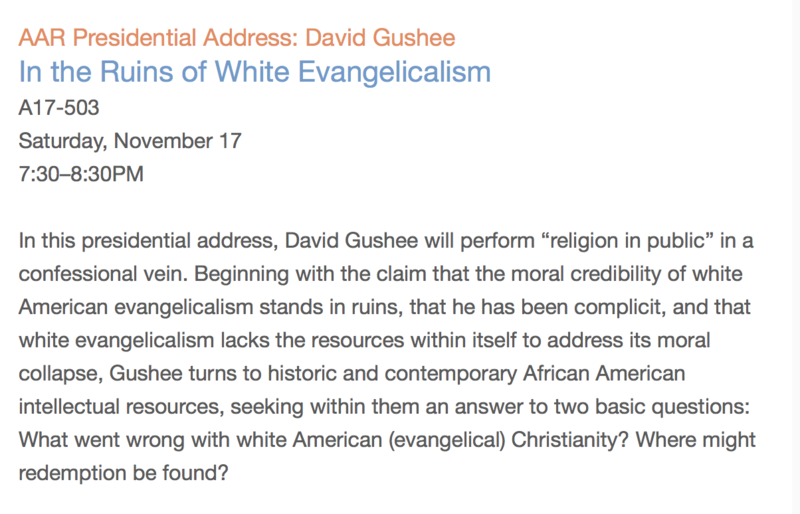 Gushee plans to draw on African American intellectuals resources in his address while the white evangelicals from Alabama fear an impending race war. But what they share is more interesting. While the disagree about their role, both of these two forms of white American evangelicalism rely on the images of black people. Gushee sees African American intellectuals as a source for white American evangelicalism to redeem itself. Black religion as the savior of white religion, as many pointed out on twitter. Meanwhile, the Alabama evangelicals cannot shake the fear of a black president and violent black revenge that drive their politics. Indeed, both Gushee and the folks in Alabama see themselves at risk. They both agree that it’s not a good time for white evangelicals in America. I won’t be able to attend the AAR meeting this year but I encourage my colleagues to attend Gushee’s presidential address. It will be a good place for the scholar of religion to conduct field work. Pay attention to Gushee’s argument. Watch for the ways that he tries to distance himself from the white evangelicals in Alabama. Also pay attention to the audience. Does he get any amens? What’s the feel in the room? Does he get any cheers? Any jeers? What happens when the “other” evangelicals talked about? Because, if the speech is anything like the abstract, it will be an opportunity to study how social actors fight over important categories and identities like “evangelicalism.” If Gushee plans to perform religion in public then scholars of religion should be prepared to study him. This entry was posted in Faculty Blog, Uncategorized and tagged American Academy of Religion, Christianity, David Gushee, Evangelicalism, Jim Wallis, religion in public, theory by Michael Altman. Bookmark the permalink. It is more than possible that I have not fully understood Beliso-De Jesús’s arguments, but it occurs to me that they are not dissimilar to and would seem to support what it appears Gushee plans to do.